A 'significant amount' of lunar water was found by NASA's LCROSS probe when it impacted a permanently-shadowed crater on the moon last month. "Indeed, yes, we found water. And we didn't find just a little bit, we found a significant amount," Anthony Colaprete, LCROSS project scientist and principal investigator from NASA's Ames Research Center at Moffett Field, Calif. The water LCROSS detected "would be water you could drink, water like any other water," Colaprete said. "If you could clean it, it would be drinkable water." 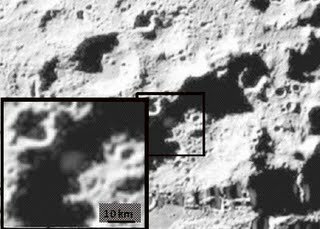 The LCROSS probe impacted the lunar south pole at a crater called Cabeus on Oct. 9. The $79 million spacecraft, preceded by its Centaur rocket stage, hit the lunar surface in an effort to create a debris plume that could be analyzed by scientists for signs of water ice. Those signs were visible in the data from spectrographic measurements (which measure light absorbed at different wavelengths, revealing different compounds) of the Centaur stage crater and the two-part debris plume the impact created. The signature of water was seen in both infrared and ultraviolet spectroscopic measurements. Fire streaked in a thin line from the muzzle of a cannon-like tube mounted beneath the viewing instruments and a tiny, rocket-powered projectile, drove towards the mysterious bulk. It hit, exploding into a cloud of incandescent vapour, and Wendis stared thoughtfully at the brilliant lines on the spectroscope screen.